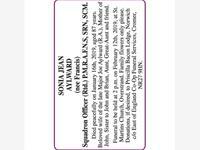 Home Search Results SONIA JEAN (nee Francis) AYLWARD Squadron Officer (Rtd.) P.M.R.A.F.N.S, SRN, SCM. Died peacefully on January 16th, 2019, aged 87 years. Beloved wife of the late Major Joe Aylward (R.A.), Mother of John, Sister to John and Brian, Aunt, Great-Aunt and friend. Funeral to be held at 2 p.m. on February 12th, 2019, at St. Martins Church, Overstrand. Family flowers only please. Donations, if desired, to Priscilla Bacon Lodge, Norwich c/o East of England Co-Op Funeral Services, Cromer, NR27 9HN. SONIA JEAN AYLWARD (nee Francis) Squadron Officer (Rtd.) P.M.R.A.F.N.S, SRN, SCM. 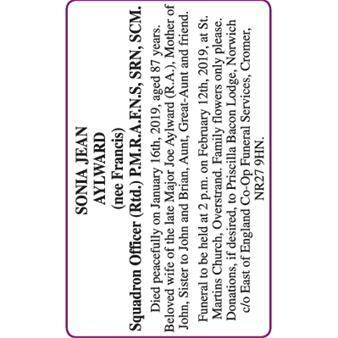 SONIA JEAN (nee Francis) AYLWARD Squadron Officer (Rtd.) P.M.R.A.F.N.S, SRN, SCM.